"Horand embodied for the enthusiasts of that time the fulfillment of their fondest dreams. He was big for that period, between 24" and 24 1/2", even for the present day a good medium size, with powerful frame, beautiful lines, and a nobly formed head. Clean and sinewy in build, the entire dog was one live wire. His character was on a par with his exterior qualities; marvelous in his obedient fidelity to his master, and above all else, the straightforward nature of a gentleman with a boundless zest for living. Although untrained in puppy hood, nevertheless obedient to the slightest nod when at this master's side; but when left to himself, the maddest rascal, the wildest ruffian and incorrigible provoker of strife. Never idle, always on the go; well disposed to harmless people, but no cringer, mad about children and always in love. What could not have been the accomplishments of such a dog if we, at that time, had only had military or police service training? His faults were the failings of his upbringing, never of his stock. He suffered from a superfluity of unemployed energy, for he was in Heaven when someone was occupied with him and was then the most tractable of dog." 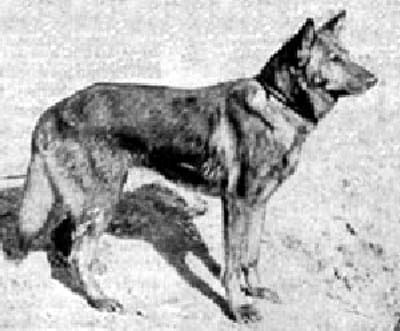 The above information is provided from the gsd pedigree database and is not guaranteed to be correct parentage nor verifiable registration numbers for them or Horand von Grafraf, the originator of the gsd's that we know and love today nor of his shown parentage. The photo provided is assumed to be of the actual dog.